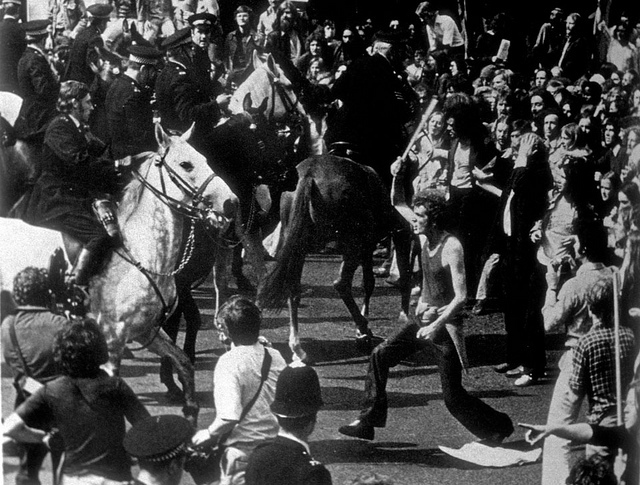 On 15 June 1974, clashes between anti-fascists and the police at London’s Red Lion Square culminated in a police charge against anti-fascist demonstrators. One anti-Front protester, Kevin Gateley, a student at Warwick University, died. He was the first person to be killed at a political protest in mainland Britain since 1919. The purpose of this piece is to explain how he was killed, who in fact was blamed, and to fit his death into the wide context of anti-fascism in British history. The events leading up to his death began in April 1974, when the Front booked the large hall at Conway Hall, a venue long associated with secular humanism and the anti-war left. In early June, the anti-imperialist campaign group Liberation, headed by veteran Labour MP Fenner Brockway, learned of the Front’s booking and attempted to book a room of their own elsewhere in the building. By 9 June, the police were aware that both the Front and its opponents planned to hold demonstrations culminating at Conway Hall. The owners of Conway Hall, the South Place Ethical Society, through their General Secretary Peter Cadogan, released a press statement defending the decision to allow the Font a room on free speech grounds. There were two demonstrations on 15 June. A Front contingent, about 900-strong, formed up at Tothill Street in central London and approached Red Lion Square from the southwest. They were held by the police and made to wait at the corner of Vernon Place and Southampton Row, about a hundred metres due west of the northwest corner of Red Lion Square. Meanwhile, 1500 or so Liberation marchers approached Red Lion Square from the northeast. In a later report Lord Justice Scarman estimated that within the anti-fascist crowd there were about 400-500 supporters of the International Marxist Group, a smaller number of International Socialists and about 40-50 supporters of the Communist Party of England (Marxist-Leninist). The front of the demonstration marched from east to west along Theobalds Road and turned left down Old North Street where it approached Red Lion Square from the north. The organisers had reached an agreement with the police that on arriving at the Square the anti-fascists would be permitted to turn left and march clockwise around the eastern edge of Red Lion Square. They would pass Conway Hall, in the square’s northeast corner and settle in the south east corner where they would hold a static protest. On arriving at Red Lion Square, it was made clear however to the organisers that the police had changed their minds and would permit a public protest only in the northwest corner of the square, that is, at a much greater distance from the Front meeting. The police therefore instructed the demonstrators to turn right, away from Conway Hall. The Liberation organisers agreed to this re-routing of their protest and about 500 people followed. The rest of the marchers however remained where they were. As for what happened next, there are two main versions. The first is the account given by police officers to the subsequent Scarman Inquiry. They reported that forty or so Maoists behind a red CPE (M-L) banner briefly pushed towards the police line on the North side of the square. In response, the officer in charge Deputy Assistant Commissioner J. H. Gerrard ordered his officers to clear all remaining anti-fascists from the northwards edge of Red Lion Square. This decision required the police to split the anti-fascist group in two: the Liberation contingent were allowed their meeting in the square’s northwest corner; the remaining anti-fascist were to be expelled from the square northwards leaving the area around Conway Hall free for the National Front to hold their meeting. In this account, it was as the demonstrators were being expelled from the square that Kevin Gateley was killed. The other version of events is the one found by Lord Scarman. In his account, the Maoists were ignored in favour of members of the IMG (‘a front of determined-looking young men with their arms linked’) who had refused to follow the Liberation organisers and led instead what Scarman termed ‘a pushing affair – the weight of a small number of demonstrators’ against police lines. This tentative push, Scarman found, grew in force, even though the numbers involved were still tiny, becoming a first ‘vicious scrimmage’, then an ‘unexpected, unprovoked and viciously violent’ assault and in its final stages a ‘riot’, to which it was the police’s ‘duty’ to respond with unrestrained force. To an event greater extent even that the police themselves, Scarman blamed Gateley’s death not on the officers who struck him but on the IMG whose failure to disperse was (for Scarman) the effective cause of Gateley’s death. At forty years distance, some of Scarman’s findings just about ring true. The measures of linking arms was a recurring anti-fascist tactic, which had travelled to Britain via the IMG from Paris. The suggestion that a couple of dozen protesters may have pushed at police lines is plausible; the police were, after all, blocking the agreed route to Conway Hall. At demonstrations, it is far from unusual for police pushes to be resisted and for something like a ‘scrimmage’ (i.e. a rugby scrum) to follow between protesters and the police. Members of the IMG, a party which in its subsequent history was never at the militant wing of anti-fascism, may well have seen the CPE (M-L) and may have pushed in the same the direction as them. Even if we accept that they pushed as hard as they could while still linking arms (Scarman’s ‘vicious scrimmage’), this is no force at all. Anyone who has attended more than a handful of protests will have seen desultory pushing of this sort; the reason why Red Lion Square is remembered is not because of this push but because of the police response, which was to escalate the conflict by charging at the crowd with batons drawn. The last photographs before Gateley suffered the blow that killed him show the student at the junction of Red Lion Square and Old North Street with his way seemingly blocked by police officers. Between Gateley and Conway Hall there are mounted policemen, riding their horses into the crowd. Gateley is three rows back from them, facing mounted officers to his front and police on foot to his side. Subsequent photographs show Gateley after he collapsed. Officers reached for Gateley’s unconscious body and lifted his foot before it fell weightless to the ground. The post-mortem was conducted by Dr Iain West of St Thomas’s Hospital. West indicated that the cause of death was a haemorrhage resulting from a head injury. He found an oval bruise at the back of Gateley’s ear about three quarters of an inch long. The injury had been caused by a hard object. It was impossible to tell from the shape of the bruise what had caused the injury, other than that it was likely to be a blunt object, possibly a police truncheon. By quarter past four, the police had succeeded in clearing the north east corner of Red Lion Square, after which they were able to bring in the Front to their meeting. Aside from Gateley, some 48 people were reported to have been injured and by the end of the day some 51 anti-fascists were arrested. Around this time, Halifax National Front established a ‘flying squad’ with a goal of confronting marches by ‘communist, leftist, immigrant or other groups’. The events at Red Lion Square fit awkwardly into anti-fascist narratives of the 1970s. For anti-fascists, it is much easier to remember a political victory (a march which demoralised our opponents and contributed materially to their isolation) than a draw or a defeat. While the accusation that the left had significantly contributed to Gateley’s was unjust, the opinion of a single Judge with too much power, too much authority, and too little insight; there must be people still living who have doubts as to how the anti-fascist contingents were organised. The key participants on the left – the IMG even the Communist Party (whose members diligently attended the inquest and published the best account of it we have), even the Maoists – aren’t the people that most historians go back to when researching the story of the 1970s. As for the setting, a central London street with no politicised black community to draw on; this is one in which the left has rarely flourished. It is also, of course, exactly the scene in which anti-fascism has been located repeatedly over the past two years.